« Future Nobel Prize-winning cancer researchers? “Neurons that fire t ogether, wire together.” This adage is a helpful reminder to students who take a course on memory and the brain. This rhyme captures our understanding that neurons have a self-reinforcing capability that links them, and that this capacity has some relation with how memory in the brain works. It makes sense that if the same groups of neurons are involved in processing some stimulus, strong and stable connections rather than weak and transient would be preferable. We use similar optimizations when we place people on a speed-dial list, bookmark a website, or create a playlist of songs. In memory, we understand the process of encoding memory involves a process called long term potentiation (LTP). A neuron signals another connected neuron through the release of neurotransmitters (chemical messengers) that span the gap between neurons called the synapse. As neurons become linked through LTP, one of the ways the receiving neuron can strengthen this connection is by having more receptors sensitive to incoming neurotransmitter messages. One of the problems for translating this LTP mechanism into a model for memory is that these cellular receptors (and just about all of the cellular machinery involved in LTP) are transient. So how can molecular receptors that come and go be used to store memories that last a lifetime? Work published here by Craddock et.al in the March PLoS Computational Biology provides an intriguing hypothesis that may help to explain how the brain stores persistent, long-term memories. 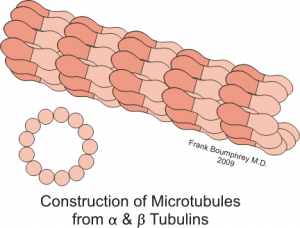 According to this group’s hypothesis microtubules might be the storage medium behind the brain’s capacious memory storage. Microtubules are ubiquitous proteins (assembled from tubulin) into tube shaped networks that makeup the cell’s cytoskeleton. In the PLoS paper, they propose a schemata whereby phosphorylation of microtubules by CaMKII could serve to create storage and logic gates that would enable the brain to store information. While there are several unknowns presented in the paper, and I at least am cautious to accept taking metaphors too literally, further experimental evidence could bear out that the brain functions very much like a Turing machine. Print article This entry was posted by Jason Williams on March 20, 2012 at 2:31 pm, and is filed under G2C Online. Follow any responses to this post through RSS 2.0. You can leave a response or trackback from your own site.